During his second Inauguration on Monday, President Barack Obama used not one, but two King James Bibles. One of the books was the Lincoln Bible, used during his first inauguration. The Lincoln Bible is currently housed in the collection of the Library of Congress and includes a note stating that this is the Bible used by Lincoln for his swearing-in as President on March 4, 1861. You can learn more about the Lincoln Bible from the Library of Congress’ blog post. 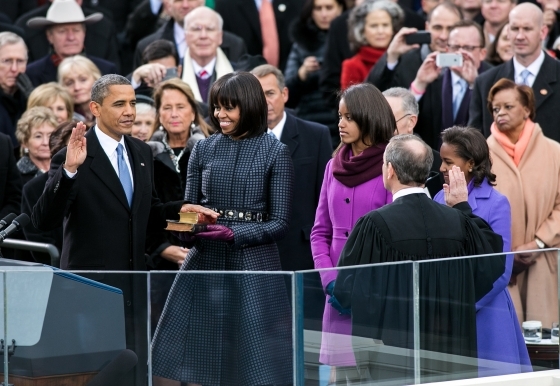 Barack Obama is not the first president to use more than one Bible while taking the oath of office. Richard Nixon and Dwight D. Eisenhower both used two Bibles during their inauguration ceremonies. You can watch Barack Obama’s second inaugural address here.